5,812 backers pledged $500,784 to help bring this project to life. Hello everyone! We are happy to present the first update of the Lightpack project, more will definitely follow. The interest towards the Lightpack project and the feedback we received so far are impressive. We are very grateful to those who supported us and backed the project — you guys are the most important asset we have! First of all we would like to clarify some points to eliminate any rumours or doubts about how Lightpack works. Look at the picture below (or click to enlarge)! Lightpack only works when connected to a computer (Windows, Linux, OS X) with Prismatik software running on it or to an Android device (with Prism app we are working on). We also support XBMC-like shells running on top of any of these operating systems. Current version of Lightpack is not designed to capture the picture directly from Cable TV, DVB-receiver, X-BOX or Playstation (read the FAQ to learn why). We’ve got rather geeky back-way and proof of concept how this capturing could be done and will tell you about in one of the following updates. Your feedback was just amazing and made us put lots of thing on considering cup. We have updated FAQ based on the questions you asked, please read it! It now contains answers for the most popular questions, for example, “Can I use several Lightpacks for one screen?”, “Will I get a device with a country-specific plug?”, “Will Lightpack work for a screen of a certain size?” etc. You can find FAQ at the bottom of the Lightpack project page. If you didn’t get any answer in our FAQ section, just send us a private message, and we’ll make sure you get a reply! How about larger (than 50’’) display diagonals? The actual answer is lying within software and depends on whether two (or more) Lightpacks can be used on one computer so you can mount Lightpacks on each screen or 2 Lightpacks on one larger screen. We are now working on the software upgrade which allows this feature to work. Our next project update will belong to a video explaining/showing how it works. Following the same request as above (multiple Lightpacks) we have added a new reward called Multipack. It gives you 2 Lightpacks for bigger TV screens or for multiple screens (for example, if you have 2 or more screens next to each other). Remember that even if you already backed, you can upgrade your pledge and get 2 Lightpacks instead of one! Someone made it public :) Initially we planned to announce this feature to the utmost a bit later or leave it when we would stretch the goal but now there is no reason to hide any more. The prototype of the software which could capture a picture on rooted Android 4+ exists! We tested it on several devices including Nexus 7 (which hardware is almost identical to the Android-based OUYA console). Here Lightpack will be directly connected to the USB-host of the Android device. Right now we’re trying to get in touch with OUYA for the final tests and making demo for you. As soon as we have it live there will be another great project update. By the way, does anybody here know someone from OUYA team? We received several comments where some of you mentioned that Prismatik was based on Qt, and asked whether it could be run on RPi, as RPi and Qt are so close. This sounds logical however technically there are some limitations. To make sure that Prismatik works correctly on RPi we have to remove all OS-dependant elements from source code. This is absolutely realistic but we need some time to do this. In the next updates you will be able to see how Prismatik works on RPi, as this feature is currently in scope of our work. We’re working hard to make new Lightpack’s features live and here we’ve described which project updates you can expect really-really soon. Stay tuned, they are on its way! Share the information about the Lightpack project with your friends or post the links to the project wherever you find appropriate — it will help us to reach the goal faster and go for stretched goals. And do not forget Lightpack has its own Facebook and Twitter pages. Hello! There are a lot of questions how many Lightpacks specific TV/multidisplay setup requires. Let's shed a little light upon! Please remember that length of cables is 70cm (28'). This is why 1 Lightpack covers up to 50'. But you definitely understand that you can't just put two and two together and get 100' with two Lightpacks. In the most frequent cases you need 2 Lightpacks for displays from 50' to 62' and 3 (!) Lightpacks for 62'-80' diagonals. It highly depends on the space between the display and the wall and which sides you want to lighten: sometimes it's recommended to mount two Lightpacks even on 50' screens. For multidisplay setups it's even more complicated because it depends on that displays orientation. We're surely going to make some simple calculator (or simple formula) for you to count this. There is a part about 30 seconds in that shows how long the LED strips are that this project uses. Many of these strips can be cut to length with scissors. You may want to think about that for this project. It could save a TON of work on your end. I have an LED kit made my Phillips behind my TV right now that uses the same tech. They are 18" long strips and are easily cut to size to avoid gaps. "Current version of Lightpack is not designed to capture the picture directly from Cable TV, DVB-receiver, X-BOX or Playstation (read the FAQ to learn why). We’ve got rather geeky back-way and proof of concept how this capturing could be done and will tell you about in one of the following updates." Hope to hear about this on your next update soon! Would this also work with the MiiPC (another Kickstarter product)? Hi, greetings form Norway. I pledged $70 for the $60 reward. I run two monitors on my computer setup and I thought: "Hey, why not another one." I see your $150+$15 is the only left right now. For me, pledging $80 + $10 on a separate account saves me $5 and I get one in July and one in August instead of two in September. Is this as intended? Pledging more should give you more benefit, right now it seems I lose my early-bird special if I upgrade my pack. Does the "MULTIPACKER" give you more than just two spearate Lightpacks? LAME. I wanted to get 2 packs but when I kick started this there was only single packs (got the $50 pack). So I lose out on that perk. I would love to get the chance at a deal on more than just 2 packs,, like 4 or 5 -- would be great to use these for mood lighting applications throughout the house (behind some speakers/behind the bar/etc),, I would definitely consider upping my pledge for more packs! -- I could always look at mixing products to get the results, but it's always nicer to work with fewer. Will there be a way for the light pack to detect when the monitor is turned off, or when the monitor is put in standby, so it turns off when the monitor is off? I don't turn my HTPC off because it serves other functions, but I do turn the TV off. I'm using a mac book pro with two Thunderbolt displays. Can I apply lightpack only to the thunderbolt displays? Is the software able to handle this kind of setup and enlighten only 2 displays out of 3? Thanks! @Mamba Enigma-Two : Great news! Our head developer will contact you as soon as possible. @RRRR : LED modules require 12V while you have only 5V in USB. Nice info graphic keep up the great work. Any chance for a demo video of it running on a low power atom box running openelec? 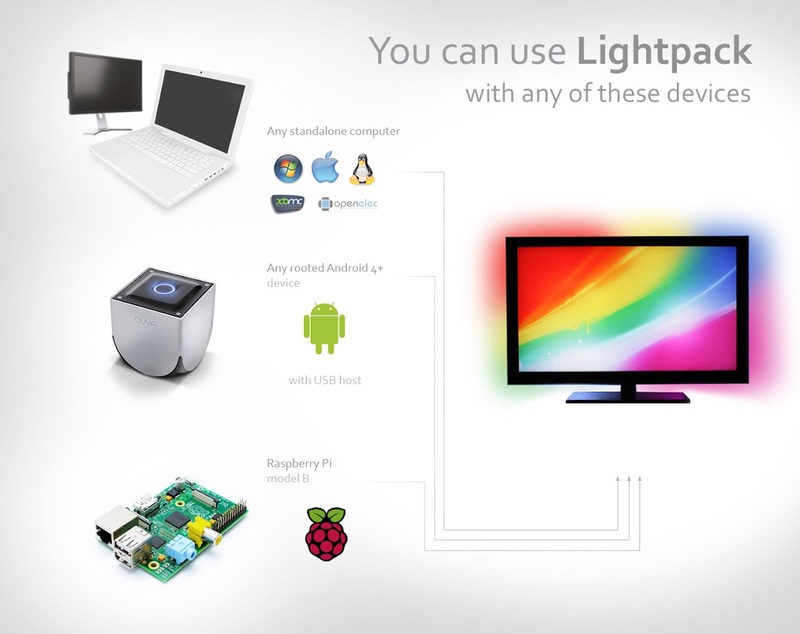 Can you explain how Lightpack will work with XBMC? The first multipack was double the early bird price, I think they did well giving the first guys to back an opportunity to get two at the same low price per unit as the early bird. They obviously have a limit to how many they want to see at that price - but they effectively did another 1000 units @ $60 each. Even now though 2 units is cheaper @ $150 the 2x the single 'standard' $80 price. Excited for the RPi support. I currently have an RPi (B) running OpenELEC XBMC on my 80". I can't wait for this! @Saul... Like most Kickstarter projects, the $120 is an early backer price. There were 500 of them... should have gotten one earlier. Same difference between the $50, $60, and $80 prices. Also $150 for 2 with $15 shipping... you're still saving compared to the regular price of $80 each with $10 shipping. Going to have to agree with others that this was a bit selfish having the $120 multipack shipped for cheaper and earlier. Now the $150 is shipped a month later + $30 more. I already backed you guys up and I let others know about how neat this is & how cool you guys are. If you bring the $150 price back to $120 and not trying to take more than you should BECAUSE your already near your goal. This is a bad move and will be remembered. Any word on whether this will work for PLEX out of the box on a Mac? SimaVision claims it does. I kind of wish you had allowed those of us that where early backers and asked about multi-packs to be the allowed to be the first to purchase them. As it is, I have to give up my early pledge price and spend more money to get a multi-pack. 2. you have a similar package on ebay with "90x RGB LEDs" for larger screens up to 80"
Should I be buying #2 from ebay instead of the multipack? I will save money and will have to deal with a single controller instead of 2. Thanks for your advice! Just wondering if the monitor's aspect ratio has any significance. I currently would like to try this on my ultrawide monitor of 21:9. Would this awesome device work with setups of multiple displays? I am the maintainer and developer of the Atmolight-Plugin, which runs on Enigma2 satellit receiver. The plugin supports the Atmolight device, as well as the Karatelight and amBX device. Lately, I am working on supporting the Sedulight device. The plugin pretty much performs on the same level as the Boblight on a PC. It uses the dual core CPU of several sat receivers and updates the LEDs up to 100 Hz. This provides for a very fluent dimming and changing of colors. The plugin runs on serveral thousand receivers, user count is growing nicely. I have backed the Lightpack project with $90 in order to receive the hardware of Lightpack in August. Can't wait to add support for Lightpack. Thumbs up for you guys! Would the following configuration work? Basically sharing the screen of the MBPR to the home theatre plasma screen, with the Lightpack installed on that screen. I am excited about the multipack! It's too bad that you had such a small amount for the discounted updated pledge, and that it was twice the price of the PIONEER level... now its an extra $15 just to get two?? Still excited, though! I don't know anyone on the OUYA team, per se, but I did back that project so I messaged them about helping you guys make OUYA support a reality. I AM SO FRICKIN EXCITED TO GET MINE!! and I'm going to have my bedroom use one. And I'm going to glue one permanently to my eyeballs so everything in the whole world is lightpack'd.